This week China is celebrating it's 60th anniversary of the founding of the People's Republic of China. In 1911, China's Republican Party overthrew the patriarchal reign of the Qing dynasty, thus opening the battle ground for dominate ruling party over the most populated country in the world. From 1911 through 1949, two major players emerged: The Chinese Nationalist Party (KMP or ROC) and the Communist Party of China (or CPC, later to be know as the CCP). The two duked it out for centuries, and after changing the face of China in the process, Mao drove Chiang Kai-shek and Nationalist party into Taiwan and, on October 1, 1949, declared himself de facto leader of the People's Republic of China (otherwise known as "Communist China" or "Red China"). Now that you have had your history lesson for the day, I am going to first say that I will do my best here on out to omit my opinion on Chinese politics and history from the rest of the post (I want to be re-admitted back into the country one of these days! Though if you want to chat off the record, e-mail me!). During my junior year of college I found myself without a major and itching to study abroad. The only consistent classes I had been taking the two years prior were every Chinese language, philosophy, and history class I could get my hands on (I found the topics fascinating and myself strangely proficient at speaking the language). One thing lead to another, and I ended up creating the University of Kentucky's first Chinese language major. I studied in Shanghai for the summer of 2004, and in the summer of 2005 finished my thesis on the Cult of Mao by traveling to over a dozen urban and rural Chinese cities to interview locals and research in person. Though it's been 4 years since I was last in the country, to say the the place and it's people have left an impression on my heart is a vast understatement. 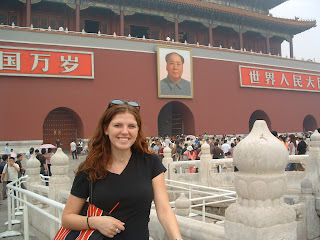 (Here I am at Tianamen Square in 2004, sporting a red due and still carrying around my Freshman 15!). I am thus keeping the people of China and the country that has so touched my heart in mind this week (to see some great pictures of how the country is preparing for it's celebration, click here). Anyone who has walked into my home can visually see how much this country has affected my aesthetics and tastes (see: my love for black, red, and white!). Everything about China, from it's poverty to it's prosperity, fascinates me on a very visual level. The culture of the people has left no stone unturned when it comes to their own aesthetic expressions and art, even on a daily scale. Their philosophical practices (that which we in the West call religion) embody and revolve around artistic expression in both an ancient and modern way (see other examples of how Buddhism has affected my own jewelry making). Even each Chinese character (NOT symbol, for the love God please do not find yourself calling them that in front of me because I will let my pet peeve take over and correct you in public!) has been thoughtfully developed over the nation's 2000+ year history to embody stories and deeper meanings. Any artist has much - MUCH - to learn from the Chinese aesthetic and approach to artistic expression. It's breath taking, really. (Since I went to China before blogging and digital photography were standard in my life, I only have a few sets of pictures online - you can check them out here). Make sure you visit their shops, too! BTW, I was in the post office the other day and a woman in front of me was trying to get something to China before their postal system SHUTS DOWN FOR EIGHT DAYS. Unfortunately, due to the country-wide celebration, her parcel could not be delivered before October 12. Woah. BTW, thanks for the history lesson. I love learning new things. Now I can totally bring this up during a conversation & pretend that I know what I'm talking about, ha ha. 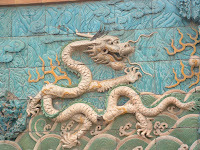 I have the same pic in the forbidden city! Love the post and china!! Field trip, anyone? Fantastic post, Christyn!! My brother lived in China, with a few breaks back home, for about four years and really enjoyed himself there. Its a part of his life I still don't know a whole lot about, but it was obviously quite an experience for him.